For those who might not be aware, influencers are usually social media users who have established credibility in a specific industry, have a large online following, and have the ability to persuade others by virtue of their authenticity and reach. They have fast evolved into an effective and scalable marketing channel, typically on Instagram, and naturally the focus is often on beauty products, restaurants, and hotels. If done right, influencer campaigns can boost company revenue by reaching wide and engaged niche audiences. According to a recent study by the Influencer Marketing Hub, businesses are making on average £7.65 for every £1 investment spent. That’s a pretty attractive return so it’s no surprise that the use of platforms for influencer marketing has doubled since 2016. VisitScotland is a big advocate of influencers, often teaming them up with visitor attractions, hotels and restaurants to create engaging and shareable content to promote Scotland as a desirable destination. So much so, they believe that influencers can help contribute to its ambition of growing tourism revenue to £1 billion by 2020. As one of the fastest-growing marketing trends for businesses and with big money changing hands, the practice is increasingly coming under the microscope and rightly so, as the power of influencers comes into question, along with their longevity. Aspiring millennial influencers are often playing the system and buying followers or using automated algorithms to create fake accounts and simulate high engagement – which to the untrained eye looks like a perfect fit. The problem is that this doesn’t add value to a product or brand, and if anything, it can devaluate it. Online endorsements can boost brands, but can often be misleading without clear description of the paid partnership through tags, captions and hashtags. Several celebrities including singers, models and actresses were in hot water last week when the Competition and Markets Authority named and shamed them for walking a thin line of consumer law. No formal court cases were explored, but they certainly got a slap on the wrist. 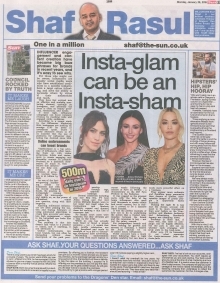 While no one has actually been fined or faced a prison sentence – yet – it seems that high profile celebrities are being penalised and made an example of in a bid to discourage continued false advertising. Misleading endorsements have been even more topical in recent weeks following the release of Fyre on Netflix – a documentary on the 2017 Fyre Festival in the Bahamas. It was pegged as the greatest party with the help of big name influencers who were paid thousands to create videos and social content, but in reality it proved to be a massive fraud scandal. It was the perfect example of how not to do it, underlining the notion that a trusted relationship between the brand and the consumer is key – not just the salary reward. For independent brands and those looking for growth and success in Scotland, I believe the focus should be on so-called micro influencers. These accounts have a much lower following than a high profile celebrity but can have a much more powerful effect on a business. They appear more authentic and therefore more persuasive than dozens of lifeless, unattainable images of pretty people in apparently exotic locations. Picking the right fit is key and the chosen account will need to be more transparent than ever before as the Competition and Markets Authority and Advertising Standards Agency are clamping down. Evidence is there that, if done well, this style of campaign can be hugely effective, but the jury is still out on whether such strategies will truly stick in the long-term. Either way, I’ll be interested to see what separates the Insta-successes from the Insta-fails. You won’t catch me in an artisan café in Glasgow’s Finnieston, typing out this column on a typewriter - and the time for me to wear my hair in a top knot has truly passed. However, I certainly have an admiration for the cultural phenomenon that is hipsters. Those enjoying a more alternative lifestyle have certainly shown a real entrepreneurial spirit that is arguably driving the local economy in Scotland and beyond. Indeed, recruitment specialists are reporting a rise in demand for baristas, yoga teachers and tattoo artists, with a surge in opportunities for the hipster service economy. The Scottish Government has continually fought the battle to end the scourge of binge drinking, and with many millennials moving away from the hard drinking stereotype to enjoy more time in the gym and at a coffee shop, it was refreshing to read that the demand for baristas now outstrips bartenders. However, the rise of microbreweries has also been on the increase, as switched on drinkers search out and buy more local craft beers and gins. So much so, it was interesting to see that England now has more distilleries than Scotland for the first time since records began, amid a craft gin boom. We have always made up the majority of distilleries owing to the popularity of whisky. However, according to Wine and Spirits Trade Association, the demand for gin has seen the number of English distilleries increase by a staggering 620 per cent since 2010. I don’t believe Scottish manufacturers need to worry though, our spirit industry is buoyant with some fantastic craft gins being distilled across the country including Glasgow’s Makar Gin and Teasmith Gin from Aberdeenshire. With this in mind, I will raise my triple, venti, soy, no foam Latte to the rise of hipsters and the positive impact that their hard-working, socially conscious ethics are having on Scottish business. Aberdeenshire Council served up one of the best gaffes I’ve seen so far this year. With a stone circle thought to be thousands of years old discovered in rural Aberdeenshire, historians and experts were delighted. The find even made headlines across the country. But as Historic Environment Scotland, and Aberdeenshire Council’s archaeology service prepared to research the site, someone was squirming at home with a cheeky secret. The previous land owner came forward to admit he added the stone circle to his land in a spot of archaeological Feng Shui. With the stone circles’ age dropping from 4,000 years to 25 years in an instant, the archaeologists were stood down. A kick in the stones for the council sure, but certainly a great laugh for everyone else. I was saddened to hear of the passing of Andrew Fairlie, one of Scotland’s best culinary talents and a much-loved chef with two Michelin Stars to his name. With tributes pouring in from across the world, it was the measure of the man to see just how many people he touched through his vision, creativity and attitude to cooking, embodied by his famous restaurant in Gleneagles. Winning the first ever Roux Scholarship in 1984, Andrew went on to train with some of the world’s best chefs before bringing his knowledge back to Scotland. Andrew had battled a brain tumour since 2005, but continued to shine in the kitchen until he passed peacefully at home with his family last week. He will be sorely missed, but his legacy will live on.